News in Brief: 'Liberty' For Greek DP's. News in Brief: 'Liberty' For Greek DP's. Dramatic scene of joy and freedom as 32 Greek immigrants, newly arrived, touch their first American soil at Bedloe's Island, home of 'Miss Liberty' (the Statue of Liberty). In their heart-felt joy they kneel down to kiss the earth. The displaced persons wave as they sail toward New York. The new immigrants cross themselves, kiss the ground, and eat hot dogs. Very American! B/W (raw newsreel?) footage of immigrants/refugees arriving at Ellis Island, New York City, c. 1940s. Very good shots of European and Asian immigrants to New York City. Ellis Island, New York Harbor, skyline. People of various ages (Eastern-European looking) on ship arriving in NY, skyline & Statue of Liberty in distance. Woman in scarf (babushka) holding child, another looking through binoculars. Great shots of crowd on deck of ship waving frantically as it approaches New York Harbor, statue of liberty (very far away and small) and skyline in distance. MS woman holding small child. MS crowd on deck facing camera - maybe eastern European. Closer shot of Statue of Liberty as ship passes it. MS from behind three little girls looking through fence/railing of ship's deck. All have bows in their hair. Nice shot. WS crowd on deck of ship, hazy NY skyline in b/g. Two shot of elderly Eastern European couple. Woman in head scarf (babushka) wipes tears from her eyes. Other shots of similar looking women crying, weeping, wiping tears. MS line of men in overcoats and fedora hats carrying their suitcases. Closer shot same. WS int. mess hall or cafeteria where groups of Asian immigrants sit and eat at long tables. CU Asian teenage boys eating. CU little Asian boy eating. CU little European boy & baby. MS OTS immigrants in silhouette looking through wire fence to NY skyline. Nice New York skyline although a little gray and overcast. MS OTS looking through fence again. Repeat, but reversed left-to right. Immigrants on steamboat ferry landing at Ellis Island. The film opens with a view of the steam ferryboat "William Myers," with passengers on 2 levels, approaching a dock at the Ellis Island Immigration Station. MLS w/ the vessel docked, workers move the gangway into place and the immigrant passengers are seen coming up the gangway and onto the dock, where they cross in front of the camera. The immigrants are of various nationalities and social classes, and there are quite a lot of families with children. Immigrants at Ellis Island, 1906. First we see people who have already gone through immigration and are now in front of building, in line to leave island. Then another group arrives carrying suitcases trunks bundles; a uniformed official directs them from the dock toward the Depot. There are people of various ages classes & European nationalities, carrying all sorts of baggage. An interesting little glimpse: In BG at left there are 2 young children, a boy and a girl, who seem to have hurried ahead on their own; they stand looking back toward the dock watching the line pass by; finally they go running back toward the dock, having spotted either their family or their luggage. We catch another glimpse of them in the line, now carrying baggage (the boy carries a heavy suitcase on his back and the girl holds a bag in her arms). Various scenes from the 1920s, most notably footage of evictions and deportations that appear to be part of or in connection with the infamous palmer raids. Men on a sunny golf course, onlookers in b/g. Soldier, with gun slung over shoulder, patrolling rail yards. Overhead pan of empty railyard with telephone poles/lines. Guard patrolling on bridge over railyard. Soldier sitting behind machine gun. Crowd of people on street as men load furniture and belongings out of a storefront (part of Palmer raid or...?) Cuts to officers arresting a woman, more shots of arrests, people being dragged from their homes. Police trying to force a man into a paddy wagon. MS of people loaded into truck, disembarking from truck. CU piled up baggage. Woman with paper held up over her face, others follow behind her (immigrants and lawyers). Deck of boat with Ellis island" on the cabin on the boat. Crowd of people, immigrants, marching on dock. TLS Statue of Liberty, POV from sailing boat; great MS immigrants huddled on boat sailing in NY Harbor, Statue of Liberty in BG; MCU immigrants smiling; MS two immigrant women wearing babushkas posing for cam, Statue of Liberty in BG; MCU immigrant father with infant son in lap. MSs newly arrived immigrants walking on Ellis Island with belongings; CUs faces of immigrants (bearded old man, young boy eating bread, another boy wearing visor cap, two boys wearing suits & Gatsby caps. MS immigrants walking w/ baggage by cam. Europeans. Immigration. New World. Voiceover and Still Photos are not available for licensing. preview cassette #97559 B People are being granted United States citizenship. Segment begins with view of a large group of men and women standing up with their right hands raised. They are taking the oath. CU of man in the crowd. CU of items sitting in the lap of one of the new citizens. Hands are resting on a small blue book with the title "Welcome to U.S.A. Citizenship". A small American flag peeks out of the top of the book. An African-American male reporter interviews a few of the new citizens. First he interviews a woman from Jamaica. Reporter asks her how she feels about becoming an American citizen. She responds by saying that she is very happy. She has been waiting a long time. MS of a Caucasian couple. The man states that freedom is the most important thing. The woman states that they love it here and they are happy to become citizens. CU of an Asian woman wearing circular framed glasses. She states, "It's really great to be here". Reporter from off screen asks her what is so great about America. The woman states, "Everything. There is not one point, everything is great". Interview with a second couple. The woman states that she likes being an American citizen because it's a free country. CU of a woman from Belgium. She states that it is the greatest day for her, she is very happy. She ends by saying "God Bless America". Traveling shots of hazy Statue of Liberty in New York Harbor, cruise ships & freighter boats passing in FG; one passenger liner is apparently the George Washington. Good though somewhat shaky TLSs Statue of Liberty. LS downtown Manhattan skyline & harbor from Staten Island ferry. Interesting tilting TLS/LSs downtown skyline, skyscrapers. Professional title sequence for "Amateur Cinema League"-- newsreel style opening for insertion at head of home movies. "The world wide organization of movie makers." Master 1490 - Tape 1 Great traveling shot from boat sailing in New York Harbor of the Statue of Liberty, Ellis Island in BG. Great static TLS Statue of Liberty; 3/4" vantage point of Lady Liberty holding torch. WLS cityscape of Lower Manhattan from across harbor; zoom in to tighter shot of skyscrapers. Tighter LS Manhattan skyscrapers, harbor & scattered boats in FG. Great full-on low angle TLSs Statue of Liberty (gray overcast skies in first shot, partly sunny in second). Traveling shot of Statue of Liberty from boat sailing in NY Harbor; zoom in to tighter shot of Lady Liberty. Traveling shots cityscape of Lower Manhattan, tugboat zipping across frame of second shot; skyscrapers. Traveling shot freighter barge sailing in Harbor. MS long line of male immigrants passing by camera outside brick building. Wide MS immigrants walking with belongings along boardwalk at Ellis Island. Cut to traveling MS Lower East Side ghetto, New York City, children running and waving at camera passing by street vendors. Excellent MS Lower East Side street scene (vendors, pedestrians, horse & carriages, policeman twirling baton). TLS NYC street scene (hose and carriages, trolleys, pedestrians, etc). 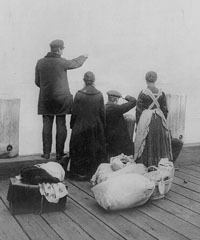 Immigrants Early 1900s (Turn of the Century): GVs lines of immigrants arriving at Ellis Island, carrying their belongings. Still Photos and Illustrations are not available for licensing. Immigrants arriving in Ellis Island.